December 1998. I started my Internet career at one of the first European e-commerce websites. At the time, we used to call it New Information and Communication Technologies. In 2013, 15 years later, some of these technologies are still seen as "New". But while in some countries seniors are stigmatized just when their experience is at its fullest, we refuse to see technologies age and be fully integrated. Ironic isn’t?! Fear of technologies that are difficult to master is understandable, but why reject them all? Why not fully embrace them and establish the boundaries of what is understandable and useful as well as personal privacy limitations? These same technologies allow us to voice our opinions directly to those who created them and to provide collaborative feedback so they may be continually improved upon in order to enhance and remain relevant to our daily lives. 1. 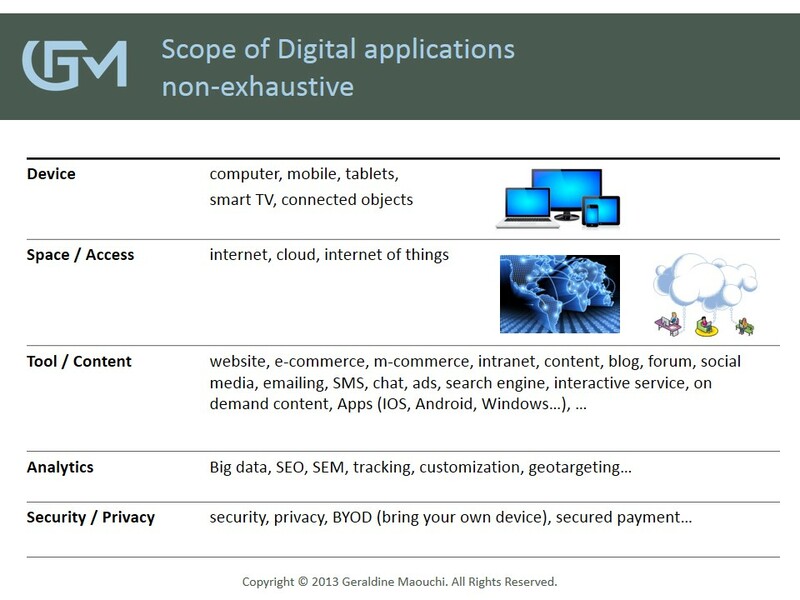 What is the Digital scope? Today we no longer use the label NICT. The current buzzword is "Digital". It is an umbrella term where everyone chooses what comes under it. Companies and headhunters are looking for "digital" profiles. Depending on professions or knowledge of the subject, they imply social networks, multimedia content creation, CRM, web-targeted "branding" concepts, IT or highly technology-oriented careers, and sometimes other things. There is a semantic divergence from the outset which skews future dialog. In fact, if we merge everyone’s thoughts and existing applications, we find that "Digital" is the entire business of technologies directed at people. It also transpires that individual vision is sometimes restricted considering what "Digital" actually has to offer and the business and societal challenges it sparks. 2. What is the impact on our environment? Digital technology has revolutionized democracy and given power to the people, helping to lead democratic revolutions and develop social activism. Digital technology gave power to the people -> People seized that power -> Digital era now supports people’s newly-found expectations. For these increasingly knowledgeable and demanding "Customers", brands must speak the truth. They are confronted with the fundamentals of customer relations: to give, to justify and to prove the worth, the meaning and the quality of their products/services. A new profile of prospective clients has emerged: digital brand tool "users". These can be considered part of a brand universe: they are not consumers, but they can be real "fans" or, conversely, brand opponents. They are involved in a brand’s social and functional sphere. They "post" a point of view, "like" an image, share a status, download a mobile App ... E.g. : the user of a mobile app -- SOS Emergency -- sponsored and produced by a health insurance other than his/her own. Digital era marks the end of ostentatious commercials and unfulfilled commitments! It is a return to values and respect for a customer who now belongs to an extensive marketing territory that has become "Social" territory. Here, the challenge is to prompt members to engage with the brand and establish close links with its networks. The territory is wider whilst communication should be more fine-tuned to appeal to a more demanding user. One solution is to personalize the relationship, which is where analytics come into play. New professions have sprung up to target communities or individuals directly. 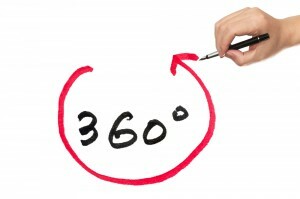 -> Digital is a Business Transformation serving a 360 vision of client and user. 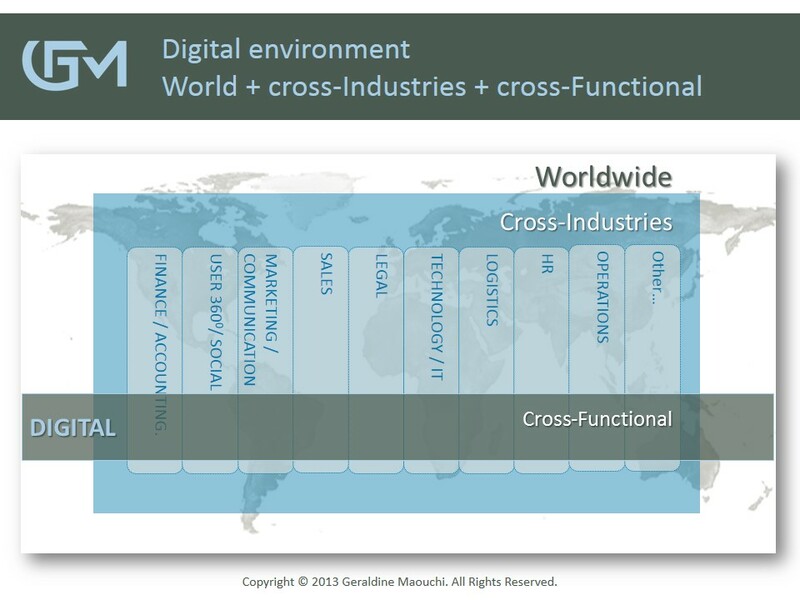 Digital business is transversal within the economic world. It allows market opportunities to be tapped outside players’ core industries. E.g. : the ACCOR hotel group "plugged" trade in second hand furniture via online marketplaces to its existing activity as a service provider. MP3 and other compressed sounds have opened and transcended geographical borders allowing music to become accessible in the most remote areas, an eco-friendly approach to be adopted by limiting physical media like CDs, and new ways of listening, sharing and downloading music to be invented. Concurrently with this, technology (computers, software, electronics ...) is less expensive. This has enabled the development of self-production and opened new avenues for artistic creation. Hence, artists can make themselves known directly to the public through social networks with low promotion costs. In terms of process and management, we now live in high-tech environment. To help the user gain a better grasp of the tools, it is useful for companies and employees to be technology savvy. They also need to be able, in this fast-moving digital world, to adapt, understand and quickly grasp opportunities for innovation and to be visionary. Speed is a key factor of success. Therefore, cumbersome organizations with never-ending processes and slow decision-making must find ways of accommodating shorter "Time to Market". Digital tools are best means to enhance speed in an organization. Speed is vital. If you do not match or possibly overtake the speed of change at which outside your organization is progressing, then this organization could be bound to see its end coming. -> Whatever the environment, we are facing major business, organizational and societal challenges. These are not only marketing and communication issues, nor are they purely technological. Business is at stake. 3. What are the business development prospects? Thus, "Digital" is not simply a new channel for media strategies. It involves new organization fully integrating the international dimension and the departmentalization of industry/sectors. "Digital" brings new processes with new work tools. It also involves a new form of cross-functional, potentially cross-industrial and global management. "Digital" is also another way of addressing customer relations, marketing and sales. Digital business supports the objectives of Marketing, Sales and Communication, whilst also offering new prospects for business development and avenues for innovation. Digital technology paves the way for creativity in business and allows new development opportunities to be harnessed beyond our usual environments. 4. How should it be positioned within the organization and what resources should be allocated? Nowadays, "Digital" is invading every aspect of our society with particular emphasis on business. It interferes and interacts with all acts. It cannot be left without control and guidance, without dedicated management. -> Digital involves a business transformation enabling an overall vision. This overall transformation can be introduced gradually based on the company’s business: it may first be integrated into a marketing or IT department or transversally with intermediaries in each department. 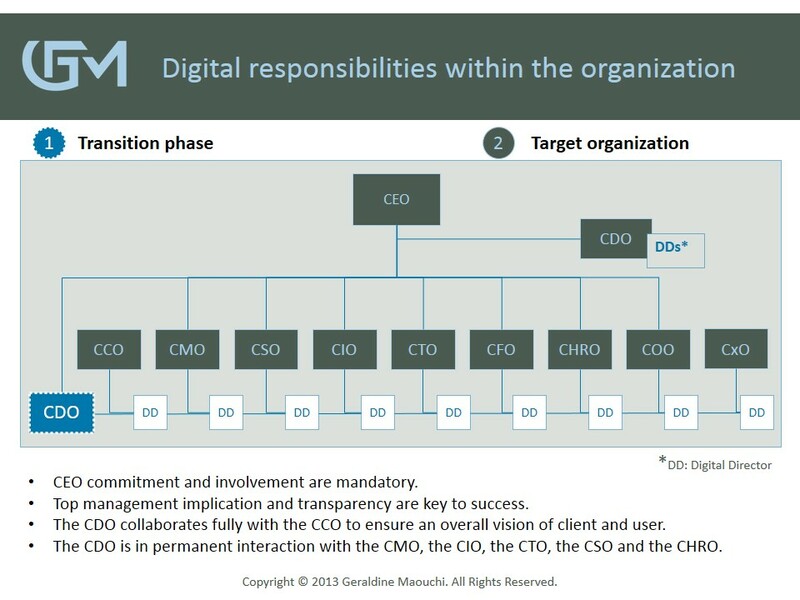 Ultimately the presence of a Chief Digital Officer is required, the involvement of the CEO is vital, and the commitment of the executive committee is pivotal. Internal coordination and management of change guarantee its success. Thus, "Digital" requires substantial resources as does any site re-organisation. Digital directors must be given proper resources to bring together the key success factors: flexibility, speed, creativity, transversality, global culture and digital skills, which are new, complex and increasingly numerous and specific. 5. What profile is required for managing Digital business? Thus, the range of skills required to master the challenges of Digital transformation and take advantage of the opportunities it affords, is particularly broad and complex. Personality and leadership are also of a new genre. A "Chief Digital Officer" is required, especially for certain businesses requiring extensive transformation. Due to the recency of these technologies, it is uncommon to find candidates who master their entire scope and are also capable of sitting on the executive committee. However, the position is widespread in some countries like the United States, and in France some companies have already gone down this route. E.g. : Renault and L'Oréal. In view of the above, it is clear that the Digital Age is a new era, involving new organization structures, new systems, new processes, new types of leadership, new forms of management, new social aspirations ... Whether a company is from the new or old economy, both types must converge towards a digital industrial model. Industrial companies must digitize and streamline processes, while digital firms must industrialize and structure themselves in order to perpetuate their business model and demonstrate profitability over the long term. 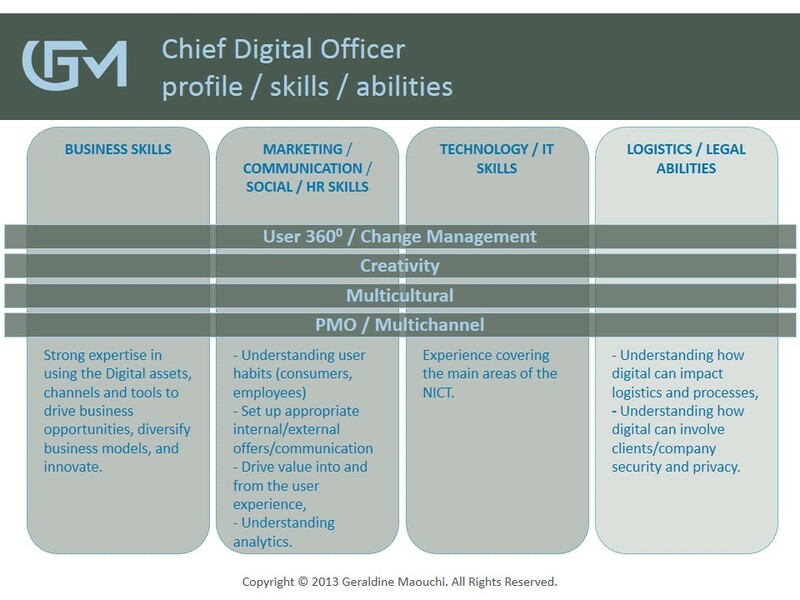 The Chief Digital Officer could be a "Chief Industrial Officer" for a digital company, but in both cases they have to wear three hats: Management + Digital + International, and to manage the generation gaps and the Y/Z generations. Ultimately, the world has already experienced industrial revolutions and although this latest one is complex, it is already fully in motion in North America. 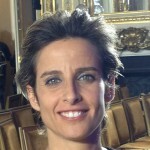 In December 1998, Géraldine Maouchi started her career at one of the first European e-commerce websites, and quickly developed a strong interest in NICT. Since then she has built her career based on a vision of a mobile web that would unite functions and industries and reach across the the world -- something that is a reality today. She has also worked on innovative digital projects and created ones in digital music and NGO. Géraldine now focuses on helping companies to embrace the industrial and social revolution caused by these digital technologies, to leverage it, and to be more creative.